Kuari Pass trek is the best window through which you can see the Mighty Himalayan mountains. It is one of the perfect & best trekking destinations in India which attracts trekkers with its charm and natural beauty. 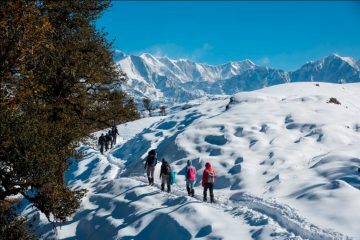 Kuari pass trekking in winters, is the best time to go as the temperature at night falls as low as -5 to -7 degree Celsius. If you are dreaming to plan for winter trekking then Kuari Pass Trek is close to paradise which can be included in the top snow treks destination among the Indian Himalayan treks. Trek guarantees you to delight and offers the very beautiful campsites and superb mountain views of Mt Nanda Devi, Chaukhamba, Neelkanth, Dronagiri, Nilgiri and Hathi Ghoda. The Kuari Pass trek is surrounded by the beautiful forest of oak and rhododendrons which are covered with snow and is straight out of those fairy tale books. Trekking in Indian Himalayas, brings up all your fantasies into the real world. Kuari Pass trek is also known as Curzon’s Trail since Lord Curzon made this trek in Chamoli region in the hill state of Uttarakhand, India. The meaning of the Kuari Pass is “doorway” and with the amount of beauty is provides it’s a real doorway to heaven. 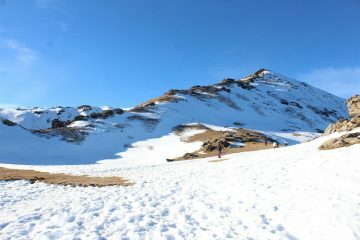 Kuari Pass Trek is one of the most beautiful and an easy winter treks in India. It is recommended for the beginners. The journey starts from Haridwar, drive through a zig sagging road to reach Joshimath. The Road is full of twists and turns and bends and it is advisable to carry motion sickness pills if you are susceptible to the ailment. The journey would take you through Devprayag which is the confluence of Bhagirathi River and Alaknanda river, Rudraprayag which is the confluence of Mandakini river and Alaknanda river and Karnprayag which is a confluence of Pindar river and Alaknanda river. This takes you to the Joshimath the base camp of Kuari Pass Trek in the evening. Night stay in a guest house. The word “Jyotirmath” literally means the place of Jyotirlinga of Shiva. Joshimath offers you the astounding view of Himalayan mountain range. The oldest tree of India “Kalpavriksha” stood at Joshimath from the time of Adi Shankaracharya. According to the Hindu Mythology, the Kalpavriksha is wish-fulfilling divine tree Joshimath is the gateway to several trekking trails and pilgrim centres like Valley of flower, Hemkund and Badrinath. After breakfast, we leave for Dhak village in vehicles from where the trekking is to commence. It takes approximately 1 hour to cover the 12 km to Dhak, which is at 6790ft. From Dhak village, it is a 6 km trek to Chitrakhana Campsite which is at 9700 ft. The trek starts with an ascending, trail that leads from the main street, towards Tugasi hamlet. The trek would take you 6 hours to complete. The night stays in tents. The Chitrakhantha campsite of Kuari pass trek is one of the Beautiful campsites. Wake up and walk to a stunning view of Nanda Devi, Kalanka, Dronagiri, Chang Bang, Gori Parvat. The trek for the day is going to take you through rhododendron and wall nut forests. The tall trees in the forest with snow everywhere around is the site one can never forget. Carry plenty of water since there is only one water source available. At Tali top, the night stays in tents. Day 04: Tali top/Khullara to Kuari pass and back to Tali top/ Khullara top. Summit day of Kuari Pass Trek is the most strenuous part of the journey. The trek from Tali top is a steep uphill climb. It is compulsory to carry sufficient water with you as Dehydration promotes Acute Mountain Sickness. There are no water sources on the way. The Kuari Pass Trek offers you a 360-degree breathtaking view of Kedarnath Peak, Kedardome, Chaukhambha, Balakun, Neel Kantha, Mukut Parvat, Kamet, Abhi Gamin, Ghori Parvat, Hathi Parvat, Dronagiri, Kalanka, Chang Bang, Nanda Devi and Nanda Ghunti Mountains. It feels as if the entire Himalayan ranges are placed picture perfect just for you to soak in all the beauty they have to offer. Today the trail through the magnificently sprawled out meadows of Gurson and descending through Auli. Auli is located at an altitude of 2,500 meters above sea level and is known for it’s skiing grounds. People from all over the world visit Auli for skiing as Auli organises International Skiing competitions. We head out to our final destination, Joshimath where the famous Guru Shankaracharya attained enlightenment before beginning his campaign for the unification of India and the revitalization of Hinduism. Spend the night in guesthouses. Congratulations! We see that you have made it to the final day of the trek. Pat yourself and carry a bucket full of nostalgia and memories as you decide to head back from joshimath. we stay the night in tents. Bang, Nanda Devi, Nanda Ghunti. City of Haridwar or maybe stay a night or two. Amazing trek team very supportive mentally …..food was very hygienic and healthy ….everyone was very caring …..excellent team work and effort. I am completed my kuari pass trek with Himalayan climber. Great trekking experience. The view from Kuari pass summit was beautiful. Thanks to staff , Neeraj sir and Chandra sir they were very caring and supportive during whole trek. The food was nice and simple, enjoyed the hot food and tea in low temperatures. Overall experience was too good with Himalayan climber. We did a beautiful trek to Kuari pass. Would recommend himalayan climber to my friends and family. The organizers were very helpful and co-operative, the services offered were outstanding, speacally the food. Thanks to team Himalayan Climber for the best trek ever. They had it all the arrangements so well. Tents were very clean, food was very tasty. Kuari Pass Trek was an experience with team Himalayan climber. We did a beautiful trek to Kuari Pass Trek. Would recommend Himalayan Climber to my friends and family. The organizers were very helpful and co-operative, the services offered were outstanding, speacally the food. I went Kuari Pass Trek with Himalayan climber in jan. 2019. Himalayan climber is the best way to experience your trekking journey in the Uttarakhand Himalayas. I did Kuari Pass Trek with Himalayan climber. team were very helpful and provided tips for booking. The food was awesome. Totally customised trek. Trek leader was friendly and makes you aware about the surrounding areas and mountains. The Kuari Pass Trek was an amazing experience. Awesome food arrangements. This was my first trekking experience in Uttarakhand Himalayas. I would love to join again with team Himalayan Climber. Himalayan climber is a great travel company. The whole experience was awesome. The arrangements, equipments, trek leader and the team was professional. I would surely recommend to do a Kuari Pass Trek with the team Himalayan climber. Kuari Pass Trek is easy and suitable for everyone. A must for the beginners. Booking steps was so easy and no hidden prizes. Accommodation were well planned, food was awesome. Truly amazing experience with Himalayan Climber. The feel was way above the clouds. The memories are endless of Kuari Pass Trek. It was truly a fantastic trek with Himalayan Climber. It was an exciting experience in the mountains. Everything was well organized, loved the entire experience with Himalayan Climber. I completed the Kuari Pass Trek with my family. Best family trek. Kuari Pass Trek is very well organized by Himalayan Climber. Journey was beautiful with the breathtaking views of the Indian Himalayas. Thank you to all the trek leader and staff. Amazing experience with team Himalayan Climber. We are 4 friends planned Kuari Pass Trek. Everything was well planned. Very energetic and hardworking staff. Would recommend others to trek in Uttarakhand Himalayas with Himalayan climber. Fantastic view of the snowy mountain peaks and a memorable trek. Kuari Pass Trek is the best trekking place, must visit. Would definitely suggest my family and friends to trek with Himalayan Climber. Fantastic, we have enjoyed a lot with team Himalayan Climber. Overall the Kuari Pass Trek was outstanding and we get great support from the staff. Food and accommodation was very good. Thank you Himalayan Climber team for making Kuari Pass Trek a memorable experience to us. The staff around you are so dedicated making this trek a successful one. Himalayan Climber group is most cooperative with us. The hospitality provided is excellent. This was my first Himalayan trek in Uttarakhand. Kuari Pass Trek is awesome and must have experience for everyone. Kuari Pass Trek was very good and indeed was a great experience with Himalayan Climber. Keep up the good work. The supporting staff chandan Negi, kk bhai were very supportive and encouraging. Outstanding trekking experience with Himalayan Climber. Kuari Pass Trekking trail is awesome for all. We wetnessed a beautiful sunrise and sunset. I had a wonderful time trekking. Highly recommend. We have been to this great mountains, streams. We had this great moment trekking in Himalayan peaks. Thanks to chandan negi and the Himalayan Climber crew. I really recommend this trekking tour company.